Rice paddies in South Korea declined 2.2 percent this year compared to last year, as farmers opted to grow other crops, according to data. 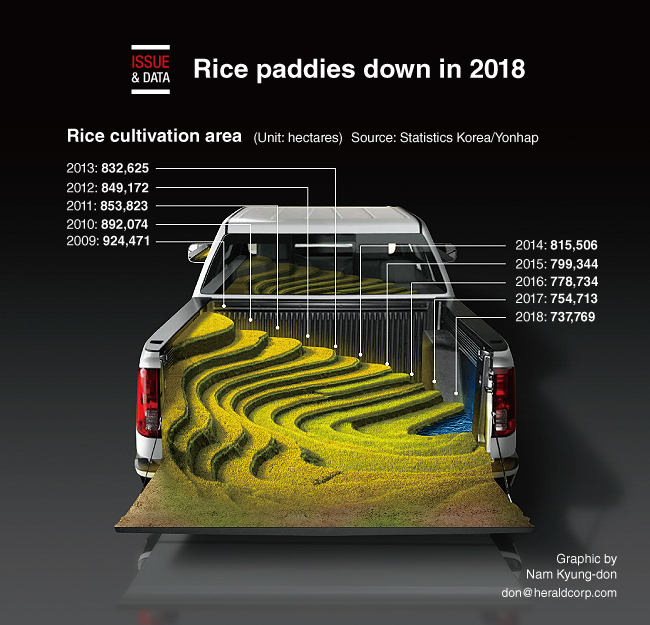 Data compiled by Statistics Korea showed that the rice cultivation area nationwide stood at 737,000 hectares this year, compared to 754,000 hectares in 2017. The government has been encouraging farmers to cultivate other crops instead of rice as part of efforts to deal with a chronic supply glut. The country has been suffering from an oversupply of rice for years. The annual rice consumption of the South Korean population has been on a sharp decline due mainly to changes in diet and eating habits.